Terra Sana Marbella prides itself on using only the best possible ingredients, and serving freshly made, lovingly prepared food. It offers eclectic California-style fare in a brightly colored artsy interior. There are now 10 Terra Sana restaurants in Spain. Four in Marbella, two in Málaga, and one in Fuengirola, Estepona, Sotogrande and Madrid. Terra Sana Marbella Restaurant & Take-Away Deli - Golden Mile CLOSED! Mom's evaluation: I like Terra Sana for offering healthy choices that taste really good such as wraps, quesedillas, and a variety of salads. One thing to keep in mind is that they offer breakfast all day! Also, they have a simple kids menu that offers chicken strips, pasta and home fries. It's got a cool funky interior and a small but cozy patio. 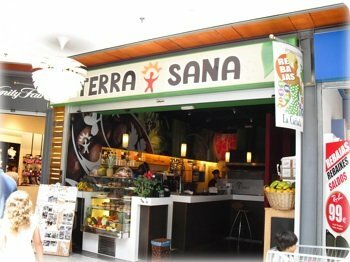 I´ve been to all of the Terra Sanas in Marbella and am only disappointed with the one on the Golden Mile. We came here once for a Sunday brunch starving. We sat down, but weren´t waited on for a long time. We finally got our menus and still had to wait to make our order. We gave up in frustration and just left. I also recently tried the restaurant in Elviria and was happy with the food and the atmosphere, but the service was terribly slow. This is a brand new franchise so I am sure they´re still training the staff and working out the kinks.